The North States Deluxe Decor Gate offers added security and style for large openings. The exclusive matte bronze finish is designed for exceptional richness, durability and depth of color while its heavy-duty metal construction is built to last! The easy one-hand operation and stay-open feature will sure to assist any busy parent. For additional security, this gate offers one swinging walk-through panel built with a child-proof double-locking system. 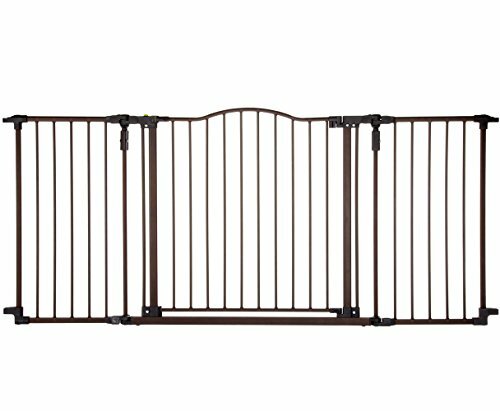 This gate panel is an extra-wide 25.5 inches wide making it the perfect size for the entire family. To keep the gate panel open, simply use the hold-open feature to prevent the gate from closing. When the gate is not in use, simply swing it out of the way. The Deluxe Decor Gate hardware mounts on straight or angled walls using pivot points on the gate panels. It's ideal for a variety of room opening measuring 38.3 to 72 inches wide and is 30 inches high. The added security and peace of mind that this gate provides is sure to please. The safety gate panel is an extra wide 25.5" wide making it the perfect size for the entire family. If you have any questions about this product by North States, contact us by completing and submitting the form below. If you are looking for a specif part number, please include it with your message.